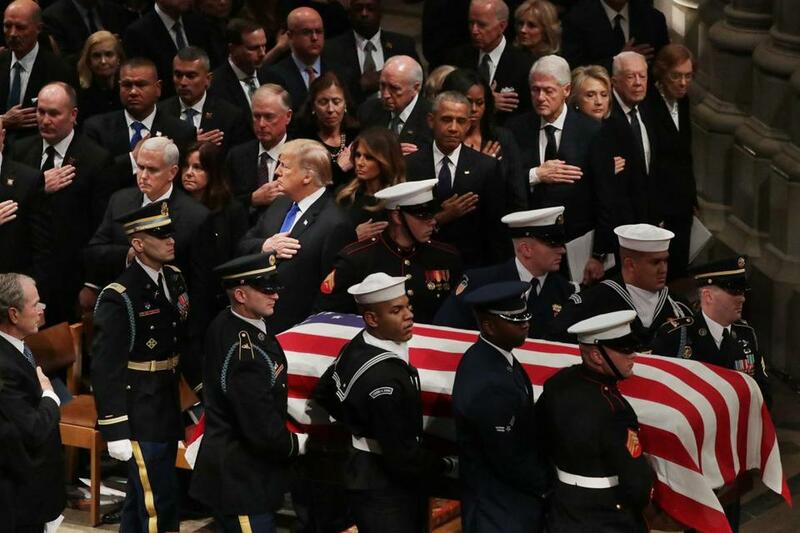 President Donald Trump, first lady Melania Trump and former presidents, vice presidents, first ladies and spouses attended the state funeral for former President George H.W. Bush at the National Cathedral. As bells tolled and choirs sang and an honor guard accompanied the coffin, the nation’s 41st president was remembered as a “kinder and gentler” leader whose fortitude steered the country through storms at home and abroad and whose essential decency set a standard for others. Former President George W. Bush fought back tears as he spoke during the State Funeral for his father, former President George H.W. Bush, at the National Cathedral. President Trump joined all four living former presidents as well as more than 3,000 foreign leaders, lawmakers, Supreme Court justices, and other mourners at the service, but given his history of rancor with the Bush family, he had no speaking role. Without directly saying so, the speakers pushed back against Trump’s mockery of the former president’s volunteerism slogan “a thousand points of light” during campaign rallies this year. George H.W. Bush died on Friday at age 94 after years of struggling with a form of Parkinson’s disease and seven months after his wife, Barbara, died. His state funeral, the first in 12 years, served as a milestone in the life of a country that has moved beyond the type of politics he preached and, with notable exceptions, practiced. The moments of bipartisan compromise that marked his presidency feel alien as the politics of division dominate Washington and the country. As with any funeral, Bush was venerated in death as he was not always in life. During his time in politics, he was excoriated for his violation of his “read my lips” vow not to raise taxes, his racially charged campaign tactics, and his inattention to growing economic troubles. He garnered only 37 percent of the vote in a three-way election contest in 1992, the lowest of any incumbent president in 80 years. But with time, Bush has become one of the most admired recent presidents, ranked third out of the past 10 in polls behind only Ronald Reagan and John F. Kennedy. During his eventful single term from 1989 to 1993, he helped bring the Cold War to a peaceful end, paved the way for the reunification of Germany, won the Persian Gulf War by expelling Iraqi invaders from Kuwait, and signed landmark environmental and disabilities legislation. “I believe it will be said that no occupant of the Oval Office was more courageous, more principled, and more honorable than George Herbert Walker Bush,” said former prime minister Brian Mulroney of Canada, a friend who was asked to deliver a tribute. President Donald Trump and first lady Melania Trump greeted former President Barack Obama and Michelle Obama as they joined other former presidents and vice presidents and their spouses for the state funeral for former President George H.W. 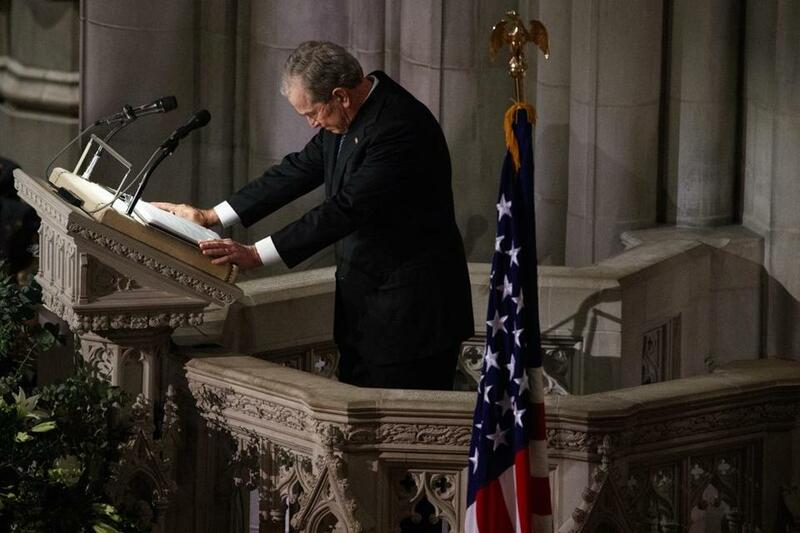 Bush at the National Cathedral December 05, 2018 in Washington, DC. For Trump, it was a chilly encounter with his fellow presidents, the first since his inauguration. As he shook hands with the Obamas, they forced palpably strained smiles. Trump did not reach past them to shake hands with Bill Clinton, who appeared open to it, much less with Hillary Clinton, who avoided looking at him. Sitting on the other side of the Clintons were Jimmy and Rosalynn Carter. 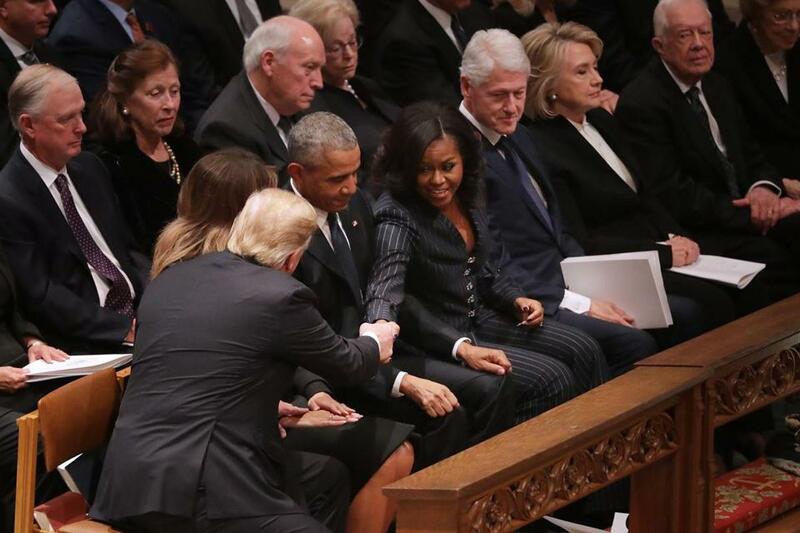 By contrast, when George W. Bush arrived, he shook hands with all of the presidents and first ladies, making a special point of mischievously slipping candy to Michelle Obama, as he did at Senator John McCain’s funeral. This was the service the elder Bush wanted, an Episcopal sendoff with all the majesty of the capital’s cavernous cathedral. He was involved enough in the planning that both Meacham and Mulroney, in separate visits, read him their eulogies in recent months. Mulroney told the story of a plaque at Bush’s home in Kennebunkport, Maine, that said CAVU — “ceiling and visibility unlimited,” a phrase from his flying days that applied to his life, too. By now, that life is well known. A son of privilege and product of an elite education at Greenwich Country Day School, Phillips Academy, and Yale. One of the youngest Navy pilots in World War II, shot down over the Pacific. Texas oilman. Congressman. Ambassador to the United Nations. Republican Party chairman. CIA director. Vice president. President. But also husband of 73 years, father of six, grandfather of 14, and great-grandfather of eight. Tennis player. Mangler of the English language. Pork rind aficionado. Broccoli hater. Prolific note writer. Practical joker. Avid speed boater. Inventor of speed golf. Geriatric sky diver. Lover of funny socks. The flag-draped casket of former President George H.W. Bush is carried by a military honor guard during a State Funeral at the National Cathedral in Washington, D.C.
Called Poppy by his family, Gampy by his grandchildren, and 41 by his son, Bush was a patrician by birth and a preppy by inclination, yet in many ways the most human of presidents. He was hardly the towering figure Reagan was, but neither was he as remote. His foibles were easily parodied, but his humanity was not. Nearly everyone who gathered in Washington had a story of a gracious personal note or gesture. As he returned to his seat, giving two pats to his father’s coffin as he strode past, Bush sat down and wiped his eyes, then laughed, probably at himself for not quite making it all the way through. His brother Jeb smiled and reached over to squeeze his hand. 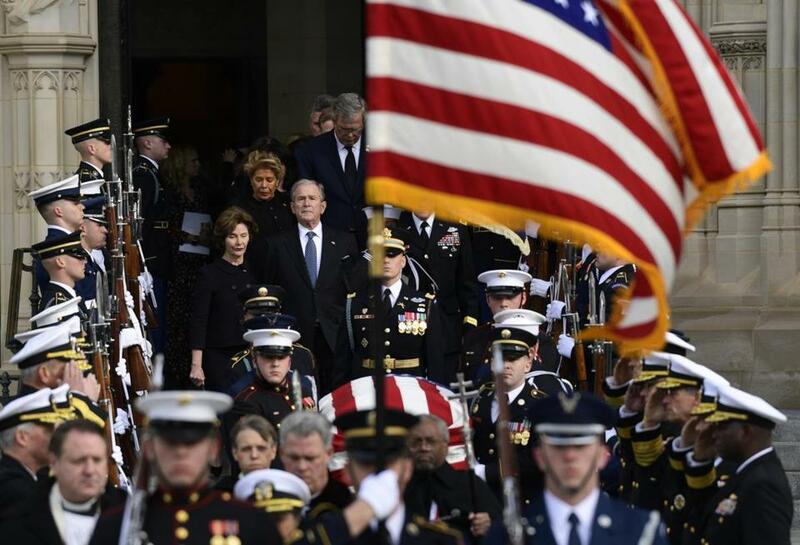 Former President George W. Bush and his wife Laura Bush, center left, joined their family as they followed the casket of former President George H.W. 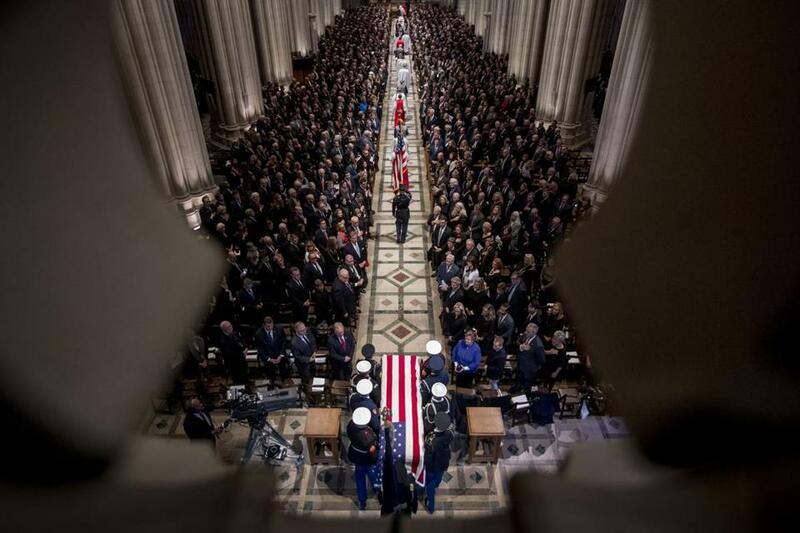 Bush as it was carried out after a State Funeral at the National Cathedral in Washington, D.C.
After the funeral, Bush’s body was flown to Houston, where a service will be held on Thursday at St. Martin’s Episcopal Church. He will be taken by train to College Station, Texas, to be interred at his presidential library next to Barbara Bush and Robin, their daughter who died of leukemia at age 3. “My hunch is heaven, as perfect as it must be, just got a bit kinder and gentler,” the Rev. Dr. Russell J. Levenson Jr., rector of St. Martin’s, said Wednesday in his homily.